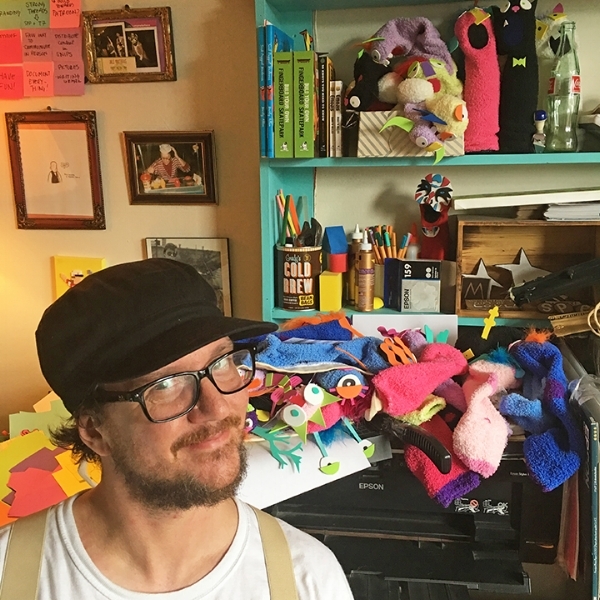 This #Socktober, I am making a Sock Puppet A Day. Follow on Instagram, see them all and buy and support at my store. Days and nights go by, I keep on making, and am sometimes left asking: WHY? Why glue foam to a sock every day? Why write a story for each one along the way? Why do any of us bother picking up the brush and the pen? What’s the danged point? If you end up going deep as a maker or an artist (or already are one), these questions, like so many rattling heaters and barking dogs, might keep you up at night. I’m left shouting from my rooftop, “Who am I to say?” And since I’m that guy who stands on his roof shouting, take my perspective with several grains of salt, and maybe a stick of butter. The most common answer as to why we make things is simple: in order to solve a problem. I need somewhere to sit, so I’ll make a chair. I need something to eat, so I’ll make an omelette. I need to express my overwhelming sense of awe in seeing the first snow of the season, so I make a punk rock song. For me, for this particular project, I was excited about puppets again, so I needed to see what would happen when I made a ton again. After all, the last time I did it, Uncle Monsterface found me. Another answer is in order to express ourselves, though I’m gonna be honest here, I feel like they’re one and the same. Ok, I know we’re just getting to know one another, but let’s go deep, gang. Stated another way, I’m saying that expressing ourselves is solving a problem. What problem? Ahem. Let’s go there. It’s kind of THE BIG PROBLEM. You know, the one we are all always addressing? This old thing question: “How do we find meaning in our lives?” This crazy answer: “We make something of it.” We make something to show the world our perspective in a moment, and we create meaning from this topsy-turvy world that seems to spin on an axis of random wildness, cruelty, and exhilaration. We make a story to make sense of a series of events, we make a painting to express our discontent, we make a child to carry our genes forward, we make a map to find our way home.